Don’t let your favours get left behind at the end of the night. Follow our top tips for choosing favours that will be cherished and appreciated. Our Woodhall Manor wedding planners are full of great ideas, so read on for their recommendations for fabulous favours. There’s no need to spend a fortune on favours. It’s easy to make homemade jams and chutneys that can be bottled in miniature jars and labelled with a personal message. Spread the love with chutney for the guys and jam for the girls so everyone gets to share. Everyone will love a bag of retro sweets, we bet they’ll be devoured instantly! Create colourful gifts by buying stripy paper bags, and filling with Love Hearts, Refreshers and lollipops. Seal with a personalised label and a ‘sweet’ thank you message. For a gift that keeps on giving, your guests will love personalised seed strips that they can take home to plant. Choose between wild flowers or delicate forget-me-nots. For something more unusual, consider mini succulents or chilli seeds. If one of you has a thing for gin and the other loves their brandy, you’ve got the perfect answer for meaningful favours already sorted. Gift miniatures of each, with a message from the couple. For a really personal touch, homebrews such as sloe gin and flavoured vodka are easy to create and can be bottled and labelled at home. Be prepared and gift your guests a ready-made hangover kit so the morning after the night before is as pain-free as possible! 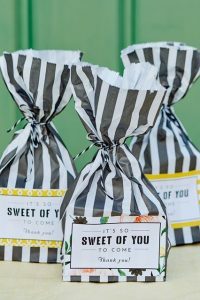 Create your own bags with headache pills, water bottles and bars of chocolate that will help your nearest and dearest weather the wedding aftermath! 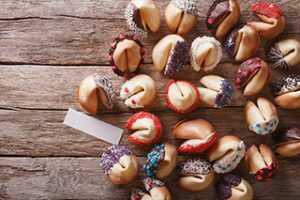 An instant hit that will get everyone talking, personalised fortune cookies are a sure fire winner. Create your own messages and watch guests get cracking to see what the future has in store for them! Personalised CDs are a cost-effective gift that guests will love to listen to, long after the party’s over. Compile the top tunes from your wedding playlist, including your first dance song and any other significant tracks and pop into a personalised card sleeve. For a cost effective option that’s unique to you, take some time to create a personalised quiz or treasure hunt. You’ll need to spend some time planning this, but the print of personalised cards is relatively cheap, and people will have great fun roaming the venue for clues, or testing their knowledge of the happy couple. There’s something hugely satisfying about gifts that your guests can tuck into immediately. From gingerbread couples to decorated biscuits and comedy cupcakes, a sweet treat presented in personalised bags and boxes are a winner. We love the idea of using your favours as an opportunity to donate to a good cause. Consider giving a charity pin and donating money to your favourite charity. Most charitable organisations have badges and lapel pins ideally suited to favours, and some even double as place name cards. So, there are our top tips for the Top Ten wedding favours that will delight and surprise your gorgeous guests. 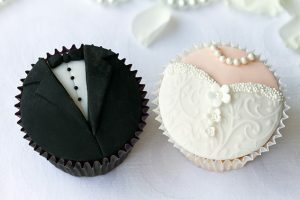 If you need some more unusual suggestions, check out this great roundup by wedding experts hitched.co.uk. To talk to one of our fabulous wedding planners about any aspect of your wedding, call us on 01394 411 288 or email info@woodhallmanor.com. Book a private viewing and discover the magic of Woodhall Manor for yourself.